You can download a preview of the book on the publisher's website. 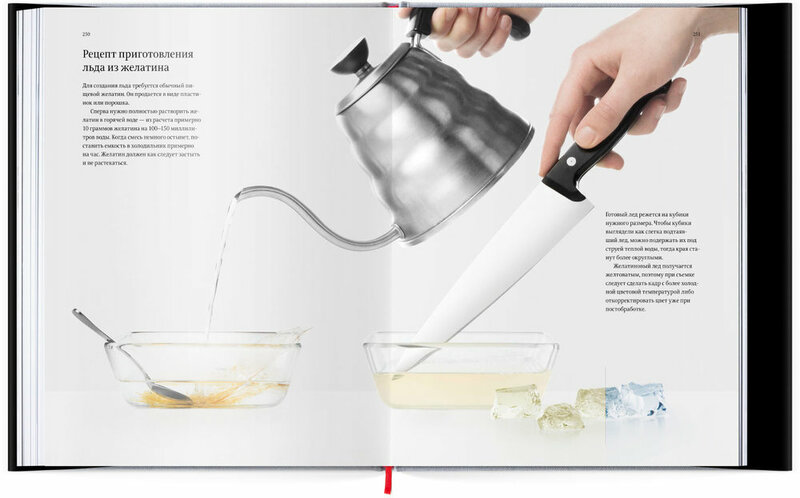 The authors of the book believe there are no two similar projects and no two identical shoots in advertising photography. Each object requires a new approach and a unique lighting setup. The book does not teach how to “frame a shot” or “set up light” but rather educates how to think and look at things like a photographer and introduces all basic methods of shooting various objects. The authors, all famous and experienced advertising photographers, describe the process of creating their best shots: they talk about techniques, effects, retouching, etc. They are convinced that after mastering the provided principles of working with light, readers will have mastered almost all secrets of advertising photography. "First, you need to forget about the base light, fill light, etc. — just get them out of your system and never think of them again. There are no such concepts in the world of advertising. Their use only hinders the photographer and creates awkwardness with the client. Getting rid of thee notions, on the other hand, allows to easily create lighting setups that would allow to obtain images far exceeding the expectations of the art director and the client. More good news: the advent of era of digital photography and the ability to immediately see the result on screen have eliminated obsolete devices such as a flashmeter or a gray card. You no longer have to carefully measure the intensity of light and compare its color temperature with that of the film. Previously, the delay between pressing the shutter button and seeing the result was so long, it took years for beginner photographers to achieve mastery. Now this time has been reduced to a few seconds."